The Forgettory was a concept first explained to me in the dear old 1970's by Dr N C Pyper, even then a most accomplished academic. He was so focussed on his quantum computational researches that, just like Sherlock Holmes when something irrelevant such as the notion that the earth went around the sun, rather than vice versa, came within his ken, he would immediately dispatch it to his Forgettory. He had in a way been anticipated by George Orwell's concept of the 'memory hole', in the dystopian novel Nineteen Eighty Four, into which inconvenient historical facts could be conveniently relegated for immediate oblivion. This technique was also regularly practised at each update of The Great Soviet Encyclopaedia, needless to say. Whilst under the bleak Soviet yoke, the Poles used to remark "Only the future is certain, the past is always changing". Cutting to the chase, the point made by The Economist in the quotation cited, has become increasingly acute with the almost frightening acceleration of technology. The Two-Cultures notion first propounded by C P Snow contrasted the utterly different cultural and educational background of classicists – who naturally look to the past for inspiration – and the technologists, who look to the future. Classicists want to preserve the best values of the past, whether artistic, literary or musical, whereas technologists (on the whole – especially those in the First World's laboratories and factories) simply want to advance the boundaries of applied science. That the moves to new generations of recording media or information-encoding algorithms or operating systems are going to maroon in a global Forgettory all the carefully-preserved cultural memories of the past – textual, photographic or audiovisual – doesn't seem to bother them one bit. They are the Morlochs, we are the Eloi. Spluttering rants by personally-negligible and socially-inconsequential individuals such as myself don't really affect the price of fish, of course, but thankfully there are now increasing signs of disquiet amongst the movers and shakers of the media. Particularly, thank goodness, in The Times, which together with The Economist and Private Eye, constitutes the Holy Trinity of the British press, strange bedfellows though they be. All these, and many others, are described in detail in a fascinating website devoted to obsolete – or obsolescing – media. Pre-recorded stuff isn't such a problem: the entertainment industry will presumably continue to migrate 'legacy content' to up-and-coming new media, or even to the Cloud, so it will continue to be accessible to the public – though some niche content (Hildegard of Bingen, anybody?) will struggle to make the cut. All the public will need is an internet link and the requisite hi-fi speakers or screens. Also of course, live musical performances will still continue and new interpretations will evolve, and new recordings will be made. That's all perfectly healthy. 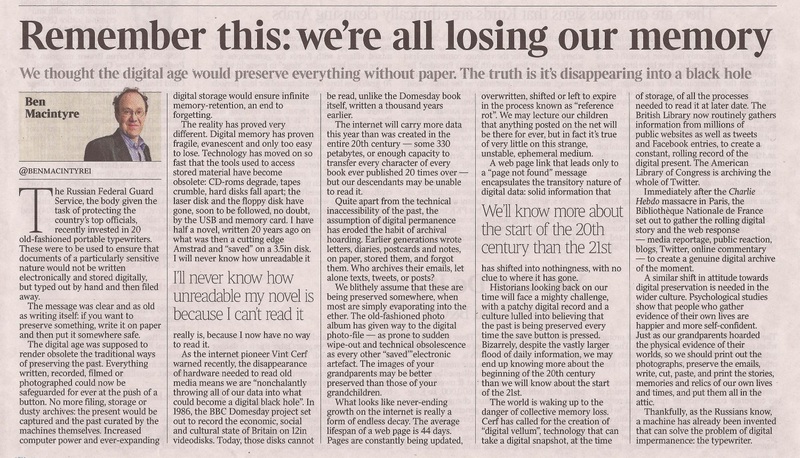 It's the recordable media situation which bothers me more ... in both professional and private life I've constantly been confronted with important recorded material on out-of-date media or encoded for software that was no longer operational and wasn't forwards-compatible. The corporation didn't care of course, because it never knew it had it anyway, but personal stuff I did regret and still do. Another issue that really bothers me is the almost total decline of the handwritten personal letter sent through the mail (I compose my letters on MS Word, then print them out, but it comes to the same thing) which can and sometimes do survive for centuries in physical form. How long will emails via (for example) Googlemail survive electronically, and who would have access to them? I save on my PC the most personally important emails I send or receive – but once that goes, so do they, unless C:/ content and access security details are passed onwards to the next generation as part of ones digital legacy – and how many rows of beans will that count for in a hundred, let alone a thousand, years from now? 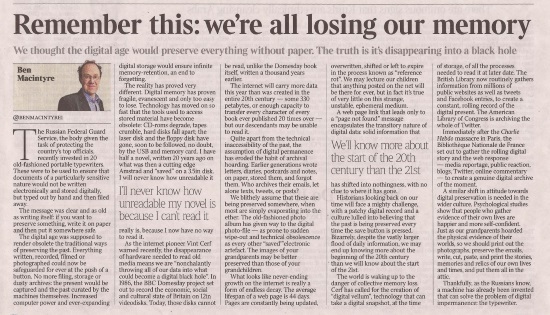 Not just me of course, but the great and the good, the people that have shaped the age we live in – have they future-proofed their personal archives for future generations of historians? 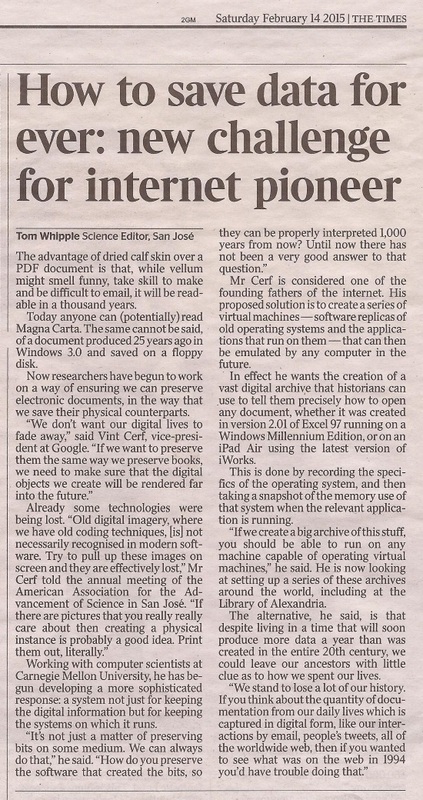 And the companies that guarantee the permanence of these archives – how long will they last? Read the following words, ye mighty, and prepare!